Sometime you must be worried about your less google adsense revenue and try to be the best to increase the revenue but all in vain and can never be successed in such situation. Although we know that google adsense highly revenue mosltly depands upon the SEO of your blog "highly seo rank of your blog better will be the google adsense income" So in today post we will give you some amazing tips through which you can easily increase your google adsense revenue. If you have any query then feel free to ask your response will back in an hour. Join us your choice here Facebook, Twiter, Google Plus, Blogger. Cool info bro! I want to ask you a simple question. Why you add nofollow attribute to SEO link? Thanks to problogger its really helpful for google adsense users. @Ankit: Your question about rel"nofollow", when ever i write the comments on any blog i also include this attribute in my backlink because. Why i used.. this attribute will not effected your SEO rank if visitors land on your blog and click on anyone links that direct from your blog. in simple when i comments on your blog i also include this with ( relnofollow ProBloggerTricks ) and it will useful for your blog..if i didnot include this attribute with my blog name then if some one clicks on this click and lank on my blog then this time your SEO will effected. your question is now that Why SEO effected. simple: Google crawler analyze your blog between onbound and inbound mean dofollow and nofollow, links if visitors clicks your dofollow links thats connects to other blogs then it will decided that your dofollow links more clickable without nofollow and can cause your SEO effected. Result: Google crawler will increase the SEO ranks and love your own links not your external if could insert nofollow to external links then it becomes internal links for it..and thus no effected thats why i am using thats. @Umesh thanks for your appreciations keep in touch you will find unique. Thanks Hafeez for your kind reply. I have still a doubt. You add nofollow attribute in your own link. That link is your internal link. You should do it dofollow so that crawlers can crawl your all pages easily and your all posts will get some PR juice. Please correct me if I am wrong! Nice to see that you have removed rel='nofollow' from your internal link. And thanks dear for your blessings. I will always be in touch with you and hope that we will always be together as a team. Happy Blogging! @ Thanks Hammad keep in touch with us. Is it possible to put the adsense in the middle of the articles? by the way thanks for giving this. I bookmark your Blog mate.. Very helped ! Thank you so much ! Thanks Bro your blog is Awesome. thanks for being here. Bro insert adsense banner below post title and also in the middle of your each post. you may use it by using the above trick. Thank you very much for, this article Very helped ! hello, thanks for this post. please how can i put this in the new blogger template. What do you mean by new blogger template. explain its clearly. Thanks for encouragements keep voice us. No where to tick in the new editor. Just click inside the template and use CTRL F to find the tag. If the tutorial requires you to find for a section of code, use Find function (Ctrl F) and find for it. If this section of code is in folded widget section, the concealed widget code will automatically expand. If the tutorial requires you to find a widget code, use Jump to widget feature to quickly locate it. After that, click ▶ to expand this widget code before editing. Useful trick for adsense users. Submit Your Articles Here Blogger. I don't know why this is not working for my blog...I've tried a lot of times...could you please advise? Your blog are impressive to each other.I read your blog its very good and friendly, Helpful for all. There are two . I placed under the second one it didn't work. The first one worked. Thanks Admin for such a nice post.Useful trick for Adsense users. If we want to show ads in center position which code is use? Can I follow same instructions to insert ads center of the blog? Nice article,,, Thanks for sharing.. Very useful post, but i want to ask you that adsense only allow 3 ads per page. I use 3 of them on my blog. So if I follow this steps then it will increase the number. I am confuse about that. Please take a look and tell me what I have to do. Hello Hafeez bro. I need a little help from you. My adsense ads are not appearing on my website. Can you please have a look. Is it OK to insert AdSense code inside the post itself ? I had rough times to put the code on the left side of my posts. Thanks for the tutorial buddy. It may be very useful for the people those who want to make money through their blogger. 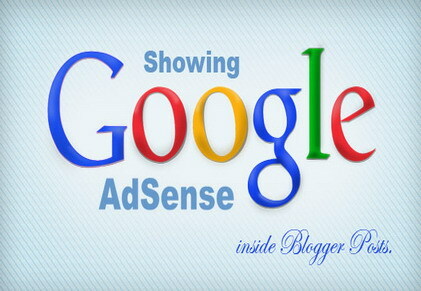 But this has provided some more information about the adding adsense to the blogger. Thank you for the nice Artical. Thanks a lot for a great sharing. Best suggestion for adsense. ads are showing only at the end of the posts?? It's a cracking article really. Concisely written and full of useful advice and links. I’ll definitely be bookmarking and sharing. Thanks you for sharing. Thanks for sharing this useful tips. I think the method is very short and simple. I am joyful to read this post, its an ittractive one. Thanks for this amazing post. I have searching this type information. I have successfully added code on middle of post. I am always searching for quality posts and articles and this is what I found here, I hope you will be adding more in future... Thanks.. I didn't get Adsense before your info.Before this i used another ad service for my blog. This method not working on my blog can you check it for me.